Louis Facey specifically applied to the BA (Hons) Digital Film and Video course (now Film Practice) at LSBU, because he felt it would enhance his professional prospects due to our excellent reputation within the industry. 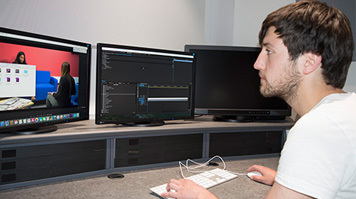 Attracted by the hands-on, practical nature of our course delivery, Louis’ faith in our commitment to producing work-ready graduates has been rewarded with the opening of Elephant Studios, a multi-million pound studio complex that gives LSBU students the chance to use the latest production facilities to hone their craft. Watch Jack, a short film created by Louis. Louis feels that being given the time, facilities and guidance to take a professional approach to directing a short film is the best element of his degree, and believes that the quality of the facilities and equipment at Elephant Studios has helped him produce work to a high standard. “I’m really excited that I’m showing my second year film at the BFI Southbank, which is one of the big benefits of being in central London,” he says. The work I am doing at LSBU will stand me in good stead when it comes to finding professional work, as well as encouraging my own creative direction.